For survey investigations in the workplace where people complain of Work Related Musculoskeletal Disorders. Consider critical tasks of a job. 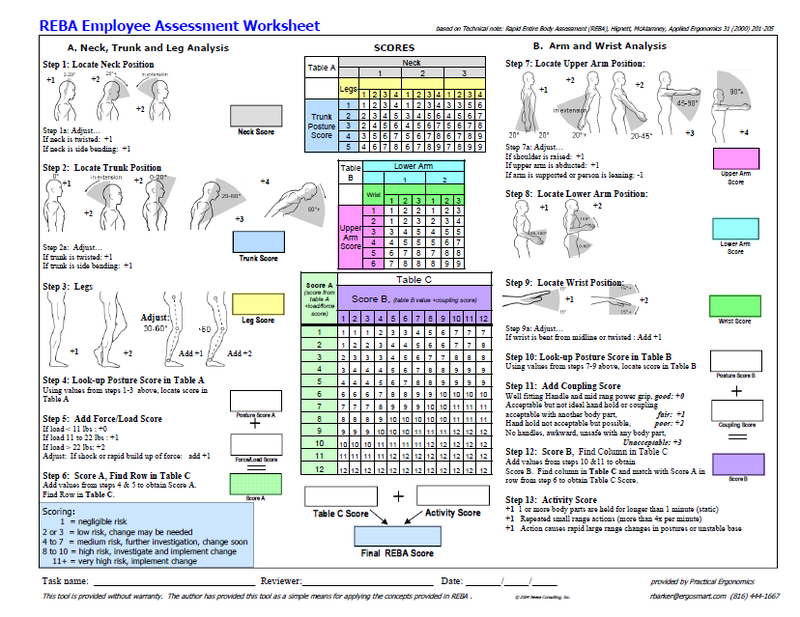 For each task, assess the posture factors by assigning a score to each region. Score the Group A (Trunk, Neck and Legs) postures and the Group B (Upper Arms, Lower Arms, and Wrists) postures for left and right. For each region, there is a posture scoring scale plus adjustment notes for additional considerations. Then score the Load / Force and Coupling factors. Finally, score the Activity. Find the scores from Table A for the Group A posture scores and from Table B for the Group B posture scores. The tables follow the data collection sheet. Score A is the sum of the Table A score and the Load / Force score. Score B is the sum of the Table B score and the Coupling score for each hand. Score C is read from Table C, by entering it with the Score A and the Score B. The REBA score is the sum of the Score C and the Activity score. The degree of risk is found in the REBA Decision table. Hignett S1, McAtamney L.Rapid entire body assessment (REBA). Appl Ergon. 2000 Apr;31(2):201-5. Initial reliability for inter-observer coding shows promise but further work is needed to establish the validity of the tool. Risk Assessment for Musculoskeletal Disorders in Forestry: A Comparison between RULA and REBA in the Manual Feeding of a Wood-Chipper. ↑ Hignett S, McAtamney L.Rapid entire body assessment (REBA). Appl Ergon. 2000 Apr;31(2):201-5.